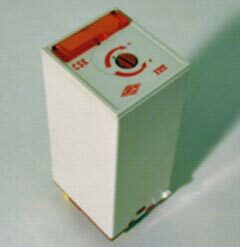 Flashing relay with fixed rythm - 4 CO contacts - 6 A.
CSK relay is equipped in its standard version of : a locking system with elastic clips on the basis and clasps on the cover, two hexagonal withdrawal clasps permitting up to 36 possibilities (function, voltage), a removable label-holder and a potentiometer on front face. * frequency : 0,5 to 2 beats per second.
. CSK relay with different flashing rythm.